Lloyd’s Register is hosting a ship scale hydrodynamics simulation workshop on 25 November 2016, at their Global Technology Centre in Southampton. Fill in this simple form to download the hull and propeller geometries of the subject vessel (16.9k DWT General Cargo Vessel REGAL) as well as simulation conditions which are identical to the sea trials records. 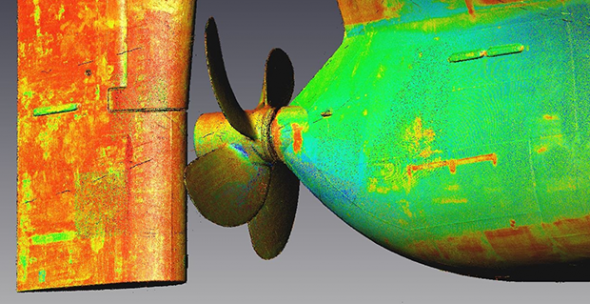 The geometries are based on 3D laser scans of the propeller and hull and are supplied in STL format. Send us blind numerical self-propulsion simulation results for the subject vessel for at least one self-propulsion condition. We also encourage you to calculate and submit resistance cases, propeller’s open water characteristics and a cavitation simulation. Results from all CFD codes, potential flow codes, marine simulator approximations and their set ups are welcome. We will provide you with a document in September 2016 that defines the format of the results to be submitted so that comparisons are unambiguous. Ship scale resistance simulation (4 speeds). As there are no ship scale resistance measurements, all results will be compared against each other. This scenario is used to investigate the hull-propeller interaction coefficients. Ship scale propeller open water characteristics computations (4 speeds). As there are no ship scale open water propeller measurements, all results will be compared to each other. This scenario is used to investigate the hull-propeller interaction coefficients. Ship scale self-propulsion simulation (3 speeds). The results will be compared with ship scale measurements performed by LR. The workshop will be structured to go through comparisons of all scenarios and provide opportunities for participants to discuss the CFD methods applied. The deadline to purchase tickets from LR for the workshop is also October 25, 2016.